John W. Lynch was born in Utica, New York on July 27, 1919. He attended Roosevelt School and Utica Free Academy where he excelled in baseball, basketball, football and tennis. Before the war, Lynch served with the cavalry unit of the 121st Regiment, New York National Guard and also served in Guam and the Philippines. His enlistment term ended in November 1941 but he re-enlisted following the Japanese attack on Pearl Harbor and served with the Coast Artillery and Signal Corps. Active in military sports throughout this time, Lynch transferred to the Army Air Force in 1943 and studied to be a radio operator at the State College at Raleigh, North Carolina and had training at Tyndall Field, Florida and Langley Field, Virginia. He went overseas to Italy in June 1944 where he was stationed with a B-24 Liberator outfit (776th Bomb Squadron, 464th Bomb Group) as a radio operator and aerial gunner. On August 24, 1944, flying his third mission, Technical Sergeant Lynch was killed over Czechoslovakia. 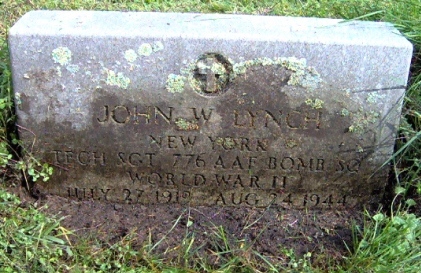 John Lynch, who was awarded the Distinguished Flying Cross, Air Medal and Purple Heart, is buried at Vernon Village Cemetery in Vernon, New York.